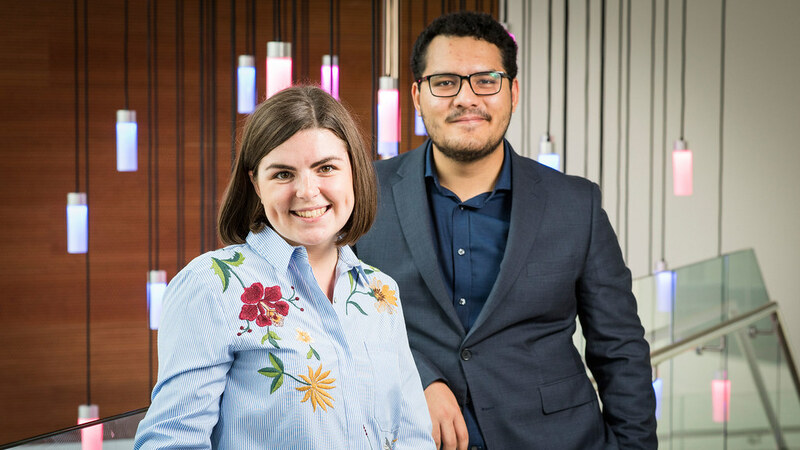 For the fifth year in a row, two undergraduate students have represented the University of Bath at an international conference for young leaders. Emma Powell and Mohammad Lone will represent the University of Bath at the 2016 One Young World Summit in Canada. Emma Powell, a third year BA (Hons) Education with Psychology student, and Mohammad Lond, a second year BSc (Hons) Economics student attended this year's One Young World Summit in Ottawa, Canada. The annual conference enables young leaders and influencers from around the world to come together and share experiences, ideas and opportunities. Our students heard from the some of the world's most influential and inspiring speakers, benefitting from their experiences and innovations. Speakers at the 2016 Ottawa summit included Emma Watson, Justin Trudeau and Maajid Nawaz, who spoke on issues ranging from gender equality to countering extremism. Speaking about the event, Emma Powell said: "The conference was an inspiring and life-changing experience, particularly as we were the only attendees representing the University of Bath." Mohammad said: "No other event offers such a great opportunity to be inspired. If this is something that takes your fancy, make sure you apply for next year’s One Young World summit. It’s the opportunity of a lifetime, I guarantee you." You can follow Emma and Mohammad's experiences through their blog. Emma and Mohammad are bringing the benefits of attending One Young World back to the University of Bath. They’re delivering an international networking session for all students through Skills Training in collaboration with the International Students Association. Emma’s prestigious role as a Coordinating Ambassador will also open up opportunities to connect with the global One Young World network. In collaboration with the Faculty of Humanities & Social Sciences, Emma and Mohammad will deliver a One Young Bath event on campus on 25 March 2017. They will invite key speakers from the summit (including two University of Bath alumni) to campus. The conference will give 150 students and staff the opportunity to attend talks and plenaries.